Conceived as an assembly line for collective movement, “One Two Three Swing!” challenges society’s apathy towards the political, environmental and economic crises of our age inviting audiences at the collaborative action. A linear orange structure, connecting dozens of three-seater swings, extending to the exterior of the building. The installation engages with the Turbine Hall’s industrial history as a site for the generation of energy and its new role as an open space in the heart of an art gallery. 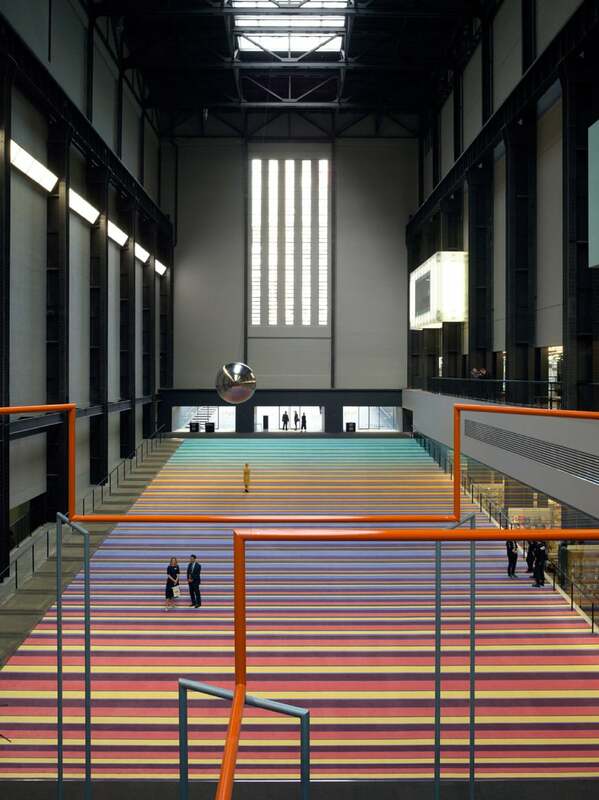 In dialogue with the surrounding architecture – the sloping entrance, the east end of the hall, and the bridge on level 1 – the installation is experienced in three states: apathy, production, and movement. 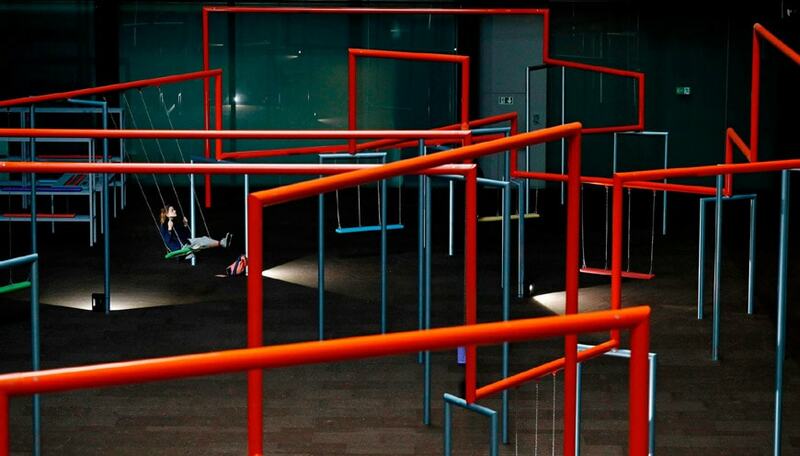 The state of apathy comprises a large pendulum suspended by a 20 metre cable from the ceiling and swinging above a 770 square metre carpet in a colour scheme inspired by British currency. Occupying the far end of the hall is the state of production, a factory station where swing seats are assembled, stamped and stored . 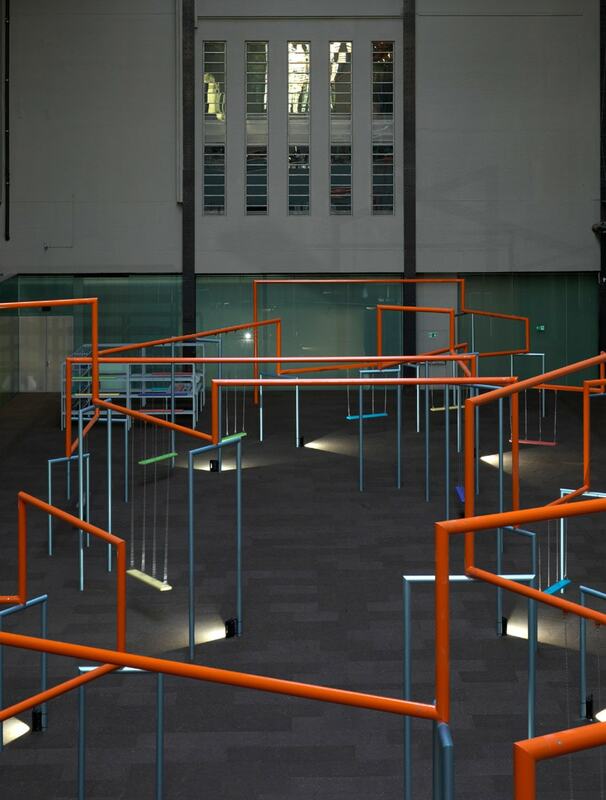 Emerging from the state of production, an orange line formed of sets of interconnected, three-seated swings invite and frame the movements of users. The act of resting in contemplation, with the hypnotic pendulum swinging above, is set in contrast to the collaborative experience of swinging together. 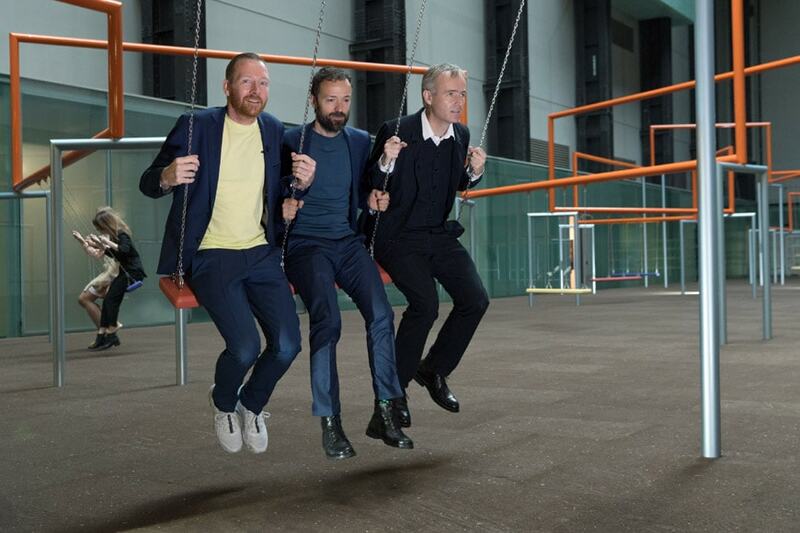 Over time the work will evolve as the orange line continues to grow and new swings are added, spreading outside Tate Modern, into the urban landscape of London and potentially beyond into the wider world. One Two Three Swing! is the third annual Hyundai Commission, a series of site-specific works created for the Turbine Hall by renowned international artists, as part of the partnership between Tate and Hyundai Motor.